SHARKS CAN JOIN YOUR ADVENTURE! Filled with thousands of fish of every shape and size, this is our largest and most popular exhibit. 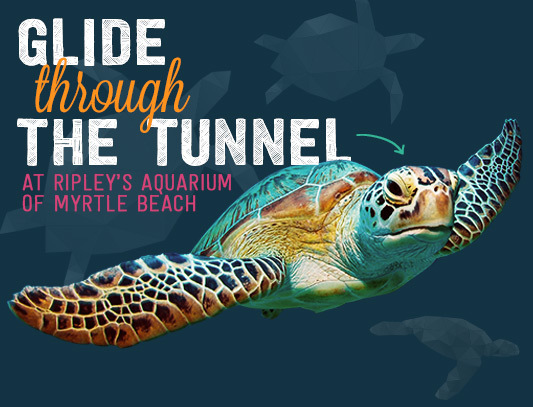 Leisurely travel on a moving 340-foot long glidepath, as you wind your way through the acrylic tunnel and come face to face with snappers, tarpons, grunts, squirrelfish, a green sea turtle, giant stingrays, sawfish, and very large SHARKS! YOU CAN ALMOST TOUCH THEM! Your family will marvel at the clarity of the water and the totally immersive environment. You will feel as if you were exploring the deep oceans and could almost touch the amazing sea life. Growing up to 8 feet long, the Green Moray Eel of the Atlantic Ocean continuously open and close their mouths to pump oxygen and water over their gills. This exposes their many teeth, giving them a fierce appearance. Recognized by its exposed teeth and its ferocious appearance, the Sandtiger Shark is the largest shark in the aquarium. Native to warm waters the Sandtiger can reach lengths of 10 feet. Considered one of the most primitive of the bony fishes, tarpons are super predators that are hungry most of the time. They can grow over 7 feet in length and weigh more than 280 pounds! 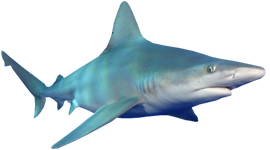 The Sandbar Shark is commonly found in the coastal waters of the Atlantic and Indo-Pacific oceans. It is usually found over muddy or sandy bottoms in shallow coastal waters, but it also swims in deeper waters. Green Sea Turtles are open-ocean travelers, but dine in shallow water on sea grass, algae, and jellyfish. Destruction of their food source and nesting habitat, and the harvesting of their eggs has placed this species on the Endangered Species List. Nurse Sharks get their name from the sucking noise they make when feeding. The noise sounds remarkably like a baby sucking on a bottle. Nurse sharks are nocturnal and will often rest on the sea floor during the day, sometimes piled on top of each other! 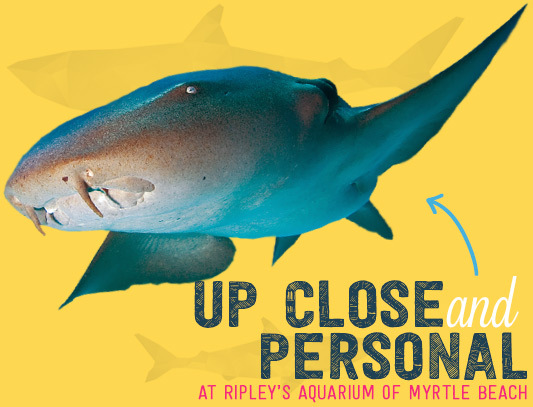 Find out if sharks sleep, when you spend the night at Ripley’s Aquarium of Myrtle Beach! After a fun filled night including a dive show, creature feature scavenger hunt, and late night activity, drift off to sleep while the sharks keep a watchful eye on you.